"Rollercoaster in the Drawing Room"
In 2005 the Shaw Festival had great success with the Somerset Maugham comedy “The Constant Wife” (1926). This year the Festival is presenting another Maugham comedy, “The Circle” from 1921. This is one of the rare cases where the Festival is giving a non-Shaw play a second production. There may be some lucky enough to have seen the Festival’s first production in 1967, but for most people the current production will be their first encounter with this fascinating comedy. St. John Hankin’s “The Cassilis Engagement” (1907) and Maugham’s “The Circle”, both on this year’s playbill, are both plays that stretch the notion of comedy to its limits. Maugham’s play does not turn the structure of comedy on its head as does Hankin’s, but it does lead to a conclusion that is comic only in its rueful commentary on human beings’ inability to learn from the past. Arnold Champion-Cheney, M.P., for three years but, despite his position and wealth, she feels trapped in a loveless marriage. Indeed, Arnold seems to be more preoccupied with an 18th-century chair he has recently purchased than he is with Elizabeth. The play begins with a to-do over the fact that Elizabeth has invited Lord “Hughie” Porteous and Lady Catherine “Kitty” Champion-Cheney for a house party thinking that Kitty’s ex-husband, Clive Champion-Cheney, would have already ended his visit. The difficulty is that Clive and Catherine are Arnold’s parents. When Arnold was five, Catherine ran away with Lord Porteous, who then was Clive’s best friend, creating a great scandal that has clouded Arnold’s life. Neither Clive nor Arnold has seen the couple for thirty years. Meanwhile, another houseguest, Edward Luton, confesses his love for Elizabeth and asks her to run away with him to Malaya. Will the past repeat itself in the younger generation as the play’s title suggests? Maugham keeps us on tenterhooks until the play’s very last moments. And by then, Maugham has added so many plusses and minuses to the question “Should they or shouldn’t they?” that you may find yourself debating the ending long after the play is over. The cast, direction and design are basically flawless. The play depends on the characters’ creating very strong first impressions which greater familiarity with them forces us to revise. Clive seems to be the moral voice of the play, the injured party from the past who wants to make peace with those who deceived him. But then we hear about the peculiar way he spends his free time in London and we wonder whether he has deliberately stayed on to meddle with his daughter-in-law’s life. Lord Porteous and Lady Catherine cut a ridiculous figure when we first meet them, dotty and quarrelsome, completely unlike the romantic picture that Elizabeth has of them. Yet, even though they adhere to no conventional moral code, we begin to wonder whether they are not truer to their own ideals than anyone else is. David Jansen shows Arnold as obsessive-compulsive, constantly worrying about the exact position of his prized chair, and satisfied that by having married a beauty he has settled all the all his obligations in life. His Arnold is so reserved we crave to hear something emotional from him and are relieved when we finally do. Moya O’Connell, a new face at the Shaw, creates a totally involving portrait of Elizabeth, torn as she is between a world of duty and stability and one of romance and the unknown. O’Connell’s intensity makes all of Elizabeth’s crises and changes of heart easily believable. Gray Powell, also new at the Shaw, is well cast as the dashing Luton, whose strong point is his unshakeable sincerity. The counterparts of these three in the older generation are all plum roles. David Schurmann is always adept at playing the wise counsellor, but here there is a twist as he gradually allows Clive’s self-satisfaction to show through and undercut the seeming disinterestedness of his comments. Imagine Antony and Cleopatra as elderly British aristocrats gone to seed and they would be much like the Lord Porteous and Lady Catherine of Michael Ball and Wendy Thatcher. 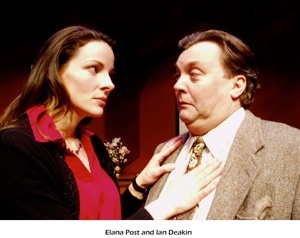 Husband and wife in real life, the two paint a hilarious but realistic portrait of the once-scandalous couple. Hughie is mutters to himself through ill-fitting false teeth while Kitty rattles on in trivial free association without letting anyone else get a word in. At one moment they’re blaming each other for ruining their lives; at another they’re making up. Underneath it, though, Ball and Thatcher let us see that despite ravages of age a real passion for each other still rules their lives. Designer Christina Poddubiuk has created a lovely, highly detailed Georgian drawing room for the set that lives up to the characters’ frequent praise of it. She does give it a sense of being a bit too perfect which suits the obsessive nature of Arnold, who is supposed to have designed it. Her costumes also express the characters’ natures from Arnold trussed up in his three-piece suit to the free-flowing tunic for Elizabeth to the slightly outré gowns for Kitty. Louise Guinand’s lighting is quietly unobtrusive. Neil Munro has directed the play with great insight into its ironies and ambiguities and allows so much tension to build up concerning Elizabeth’s decision that he has you on the edge of your seat right until the end. If you think of drawing-room comedies as staid, think again. In the hands of Maugham and Munro it becomes an exhilarating intellectual and emotional rollercoaster ride. Don’t miss the thrill. Photo: David Janson and Moya O’Connell. ©David Cooper.